One of my favorite things to do in life is to bake. I love making a mess in the kitchen, creating something delicious, and then sharing my homemade treats with friends and family. Decorated sugar cookies are always a big crowd-pleaser (not to mention that the cookie dough tastes delicious!) but I don’t make them too often because they tend to take a lot of time and energy. But this time around, it was worth it! I found a great recipe for big batch sugar cookies on the fabfood website and it was fantastic! 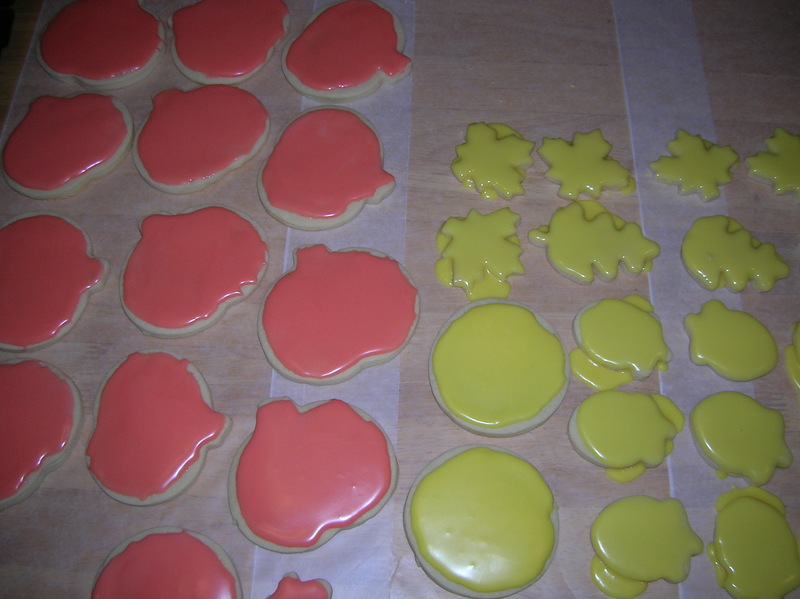 This particular recipe made 53 total cookies of mostly medium size and in fun fall shapes. That last part really doesn’t have anything to do with the recipe, I just thought I’d throw it in for good measure. My favorite part was that the entire recipe could fit in my KitchenAid, which is always a bonus! Pre-heat your oven to 350 degrees. Cream butter and sugar together. Add eggs and vanilla. Mix dry ingredients and add to the butter mixture, mix well. Chill for 1 hour. 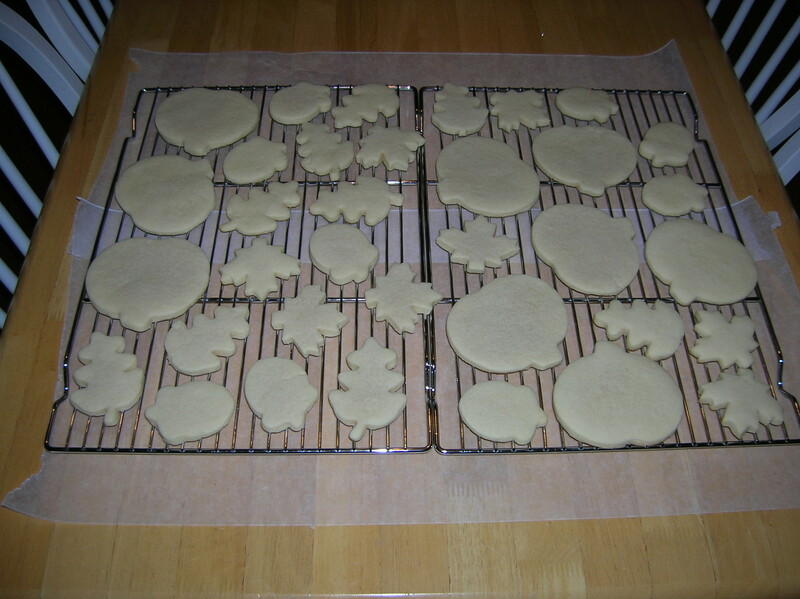 Roll out the dough to 1/4 inch thickness and cut with cookie cutters. Bake for 8-10 minutes. Cool 2 minutes on the baking sheet before removing to cool completely on wire racks. Quick side note about the cookies, I ended up baking them for about 8 minutes and 30 seconds. You don’t want then to bake for too long or they’ll get to crunchy. When you take them out of the oven, they might look like they still need some cooking time but trust me, they’ll be perfect once they cool! Next step- add the perfect glaze on top of your cooled cookies. I got this particular recipe from my mother and it is my all-time favorite thing to go on top of sugar cookies. It sets up hard so you can stack them once completely dry, but it stays smooth and creamy on the inside. Not to mention it tastes amazing! Mix water, corn syrup, and almond extract until the corn syrup is dissolved. Add the powdered sugar and mix until smooth. The yellow batch is the consistency that you get from the recipe above. Very easy to work with, but runs off the sides a bit. For the orange glaze I added a teensy bit more corn syrup to the original recipe. It was still really easy to spread on the cookie and I like that it didn’t run off the sides at all. You’ll just have to experiment with it yourself and see what you like best! I let mine sit out overnight so that they would be ready to stack and put in a container in the morning, but letting them sit for just a few hours should also be sufficient.